his article is intended to assist you with setting up port forwarding on your Gigaset phone. Please read this guide if you need further help with port forwarding. In order to find the IP address of the Gigaset base station, please press the button located on the front of the base station (usually this is plugged directly into the router). This will then page the Gigaset handset and display the IP address of the base unit on the phone. Please make note of the IP as this will need to be entered into your web browser next. Type the IP address that is displayed on your phone into your web browser. A page should then be displayed that will prompt you for a pin to login. If the phone has been purchased from Gradwell, the default pin is 0000. On the phone's web interface click Settings, and then click the IP Configuration tab on the left hand side. You will now need to statically assign the phone an IP address. The below image gives an example of the required fields. You may wish to set the Preferred DNS and Alternative DNS to use Gradwell. Our DNS servers are 195.26.36.3 and 195.26.37.3. Once you have entered the information, click Set. The device will then reboot to apply the new IP address. 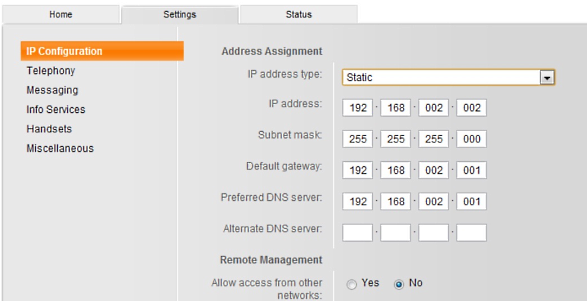 To configure the SIP and RTP ports on the phone click the Advanced Settings tab in the left hand menu. The default SIP port for the Gigaset device is 5060. If you are using multiple phones you will need to stagger the SIP ports. From example, the first phone would use the SIP port 5060 and the next phone would use port 5062. Please see this article for more help with this. By default, the RTP range is set to 5004 - 5020 on the Gigaset device. These ports will need to be staggered in increments of 18 if you have multiple base stations, for example 5020 - 5038. Do not specify the RTP port range of 5060 to 5082, as these are for the phone's registration. Instead start again at port 5090 and continue in increments of 18.